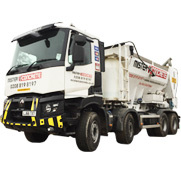 Our modern fleet can get to the most of the driveways trhoughout the London and Surrey area. In order to make sure whether our truck can access your project please check the dimensions down bellow. 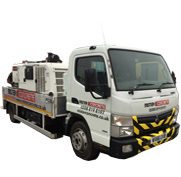 In case our trucks won't be able to fit your narrow driveway our line pumps can pump the concrete to inacessible areas up to 150 meters horizontally and 50 meters vertically from the truck. Always check with our operators regarding the detail of the access. Modern volumetric truck feed is able to get to the most of the sites throught the area we cover. 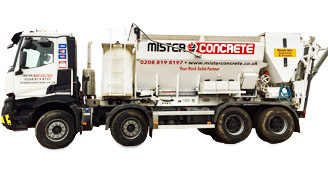 Water, cement, sand and aggregates stored in separate compartments and ready mix mixed right on sight ensuring delivering fresh and high quality concrete. 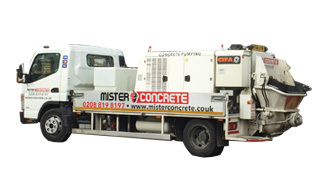 Our line pumps allows us to get a concrete to almost any inaccesible area throughout the London, Surrey and Berkshire. 150 meters horisontal and 50 meters vertical range makes almost every job an easy task. Most of all the concrete gets to where it is supposed to get leaving no mess behind.